Friday night and Saturday afternoon, ECMWF model runs make warmer changes to the 4-15 day outlook. Warmer forecast model change to add more downside risk to the natural gas market. Less demand plus more inventory build could accelerate prices lower in favor of the bears and investors in UNG, DGAZ, and KOLD. The past couple of ECMWF model updates have turned warmer in a big way. This will add downside pressure to prices next week. On Friday, the front-month May futures contract, which trades on the New York Mercantile Exchange (NYMEX), settled 0.4 cents lower to $2.66, as did the June contract which settled at $2.70. It was a quiet trading day with the trading range during Friday's session again being very tight at only 4 cents from $2.69 to $2.65. The United States Natural Gas ETF (NYSEARCA:UNG), which is the unleveraged 1x ETF that tracks the price of natural gas, finished Tuesday slightly lower 0.77% to $23.35. 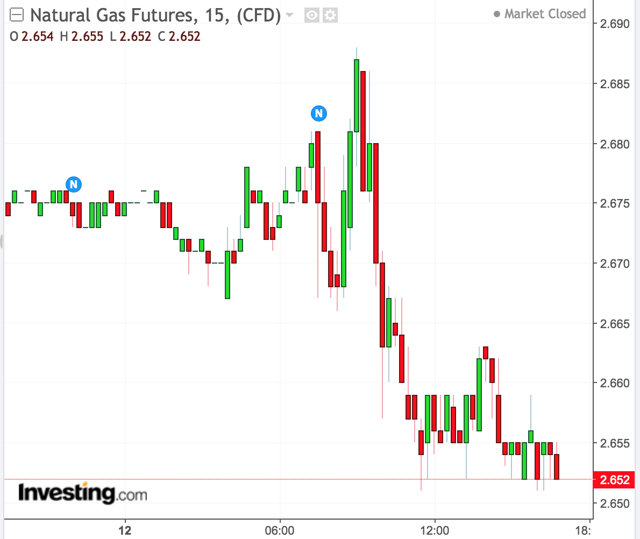 The VelocityShares 3x Long Natural Gas ETN (NYSEARCA:UGAZ) and the ProShares Ultra Bloomberg Natural Gas ETF (NYSEARCA:BOIL) were seen down 1.93% and 1.22% to $28.46 and $20.22, respectively. Meanwhile, the VelocityShares 3x Inverse Natural Gas ETN (NYSEARCA:DGAZ) and the ProShares UltraShort Bloomberg Natural Gas ETF (NYSEARCA:KOLD) were seen up 1.75% and 0.94% to $108.56 and $22.62, respectively. Figure 2 below is a chart showing the price trend of NYMEX's front-month May futures contract over the past five days. Multiple factors went into the quiet and slightly lower trading day. Amongst those factors included production being cut due to ongoing maintenance, LNG exports increasing, mixed weather model data, a milder outlook in the medium range, and a lightened demand. Overnight Friday and Saturday afternoon, newly fresh weather data from the ECMWF revealed a more bearish outlook than its previous runs. Friday's 0z and Saturday's 12z runs both indicated a big warm change in the trend. If the next set of model data holds, this will likely increase downside pressure to natural gas futures and UNG prices next week. In my previous article, I mentioned the possibility of increased downside risk being applied, and this is one of those scenarios. Figures 2 and 3 are 4-9 day and 10-15 day 850 mb temperature anomaly maps comparing the outlook from Friday's April 12 12z run to Saturday's April 13 12z run from the ECMWF model. Figure 4 is the Day 15 850 mb temperature anomaly maps comparing the outlook from April 12 to April 13 from the ECMWF model. I'm keeping my price range of $2.50 to $2.80, with increased confidence of prices to gap down over the next week given the warmer outlook. UNG should trade between $21.00 and $24.60.